Aqua Pools carries a complete line of premade water features, or we can build you the custom features you desire. We’ve listed some of the most popular products here. Reach out to our pool design pros to discuss more customized pool and water features, such as natural rock surrounds and waterfalls. Water features add entirely new elements to enjoying your pool. Add waterfalls, lighting effects, tanning shelves, swim-up bars, and more! Your Aqua Pools design specialist can help you determine which water features and lighting effects will create the look and style you desire. 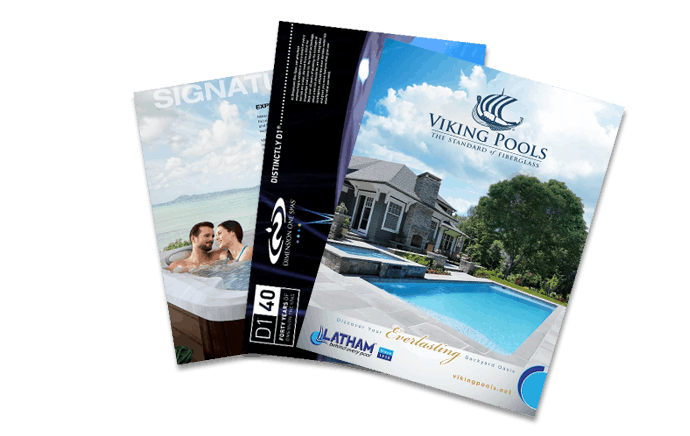 Browse our selection to get some great ideas for creating your new pool or updating your current pool! Hayward® pool equipment has been around for more than 80 years. Hayward prides itself on designing and manufacturing high-quality products that are made to last, while introducing some of the most innovative concepts and designs in the pool and spa industry. Hayward is also dedicated to environmental responsibility both in their manufacturing operations and in their products’ installation and operation. The Hayward Deck Jet 500 is easy to adjust, so you get the perfect stream of water to create an entirely new element of asthetics and pure, simple fun to your pool environment. Add lighting effects for an even more stunning spectacle! The Hayward ColorLogic® creates a glasslike stream of water that gracefully flows from the deck to the pool. Combine it with Hayward’s ColorLogic Lighting to add a dramatic flair worthy of world-class resorts! Turn your pool into a natural-looking lagoon with waterfall effects by Hayward. The Sheer 500 can be completely customized for your pool, providing a waterfall effect that blends into the backyard setting, creating a natural-looking oasis. The ColorLogic Bubbler delivers a cascade of water that, when paired with Hayward’s ColorLogic lighting effects, creates breathtaking effects in your pool. Talk to your design specialist at Aqua Pools to determine which water features best suit your dream pool.